Speaking of Alaska – KeaPod 25 | KeaNeato! The Grand Pacific Margerie Glacier as seen from the MS Statendam on 2 July 2010. Earlier in this blog, I introduced you to wide-shot photo of the Grand Pacific Glacier Margerie Glacier (KeaPOD 16) and to a closer view (KeaPOD 18). Having just posted a link to the Wooster Geologists field work in Alaska, I thought a final look at this glacier would be in order. 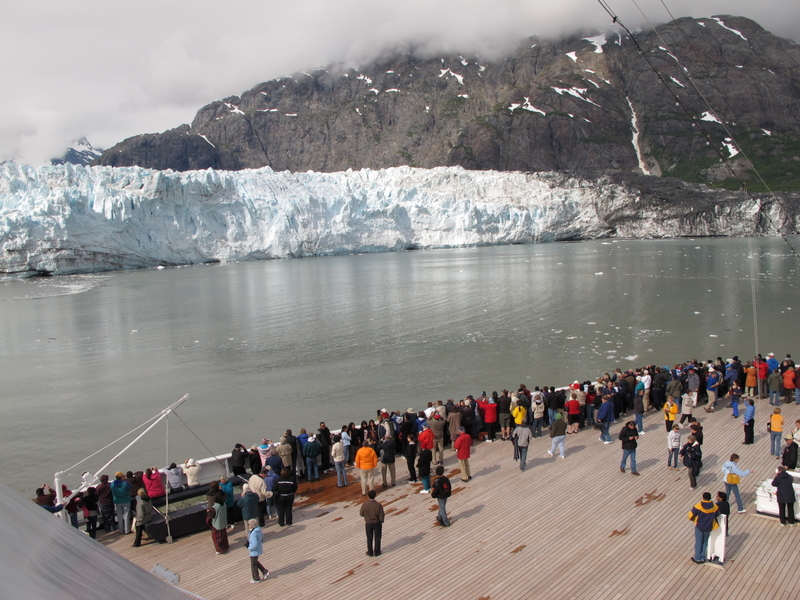 This view, from near the top of the ship, helps to put the glacier into perspective. We were still quite a ways off from the glacier, yet you can get an idea of about how big it is and how far the ripples extend when the glacier calves, sending sections of ice down into the water and waves of sediment outward. This entry was posted in Nature, POD (picture of the day) and tagged Alaska, keagiles, Margerie Glacier, photography. Bookmark the permalink.